Pedestrians walk along Rua XV in Curitaba, Brazil. 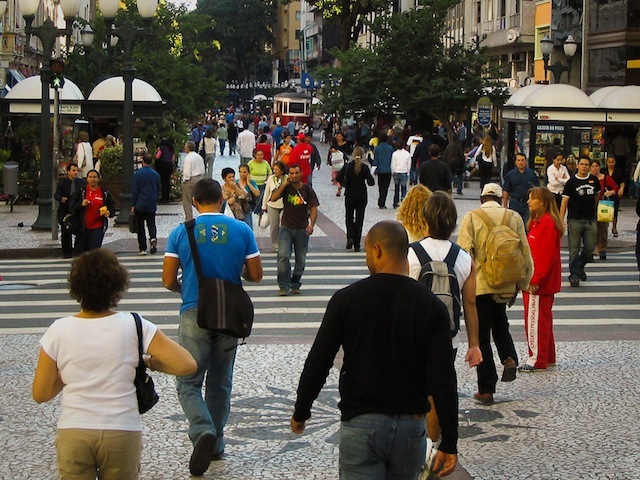 The congregation of people in the streets is a part of the sustainable development that TheCityFix Brazil works towards. Photo by Dylan Passmore/Flickr. The TheCityFix Brazil is in a race for the third consecutive Top Blog Award. In last year’s competition, TheCityFix Brazil won in the Sustainability category. This year, the blog is moving to the final stage of the competition, vying for the title of Best Sustainability Blog for Brazil with 99 other blogs. Invite friends, readers, partners, and allies of the cause of sustainable transport to vote and together carry forward the dialogue on sustainable mobility in Brazil’s cities. Click here to vote for TheCityFix Brazil. TheCityFix Brazil’s blog focuses on specifically issues related to sustainable transport because transport is a linchpin tying together many diverse areas of sustainability. By blogging about sustainable transport, it creates a paradigm to holistically tackle issues from economic development, environment, and health that can help move Brazil toward a more sustainable future. We are working towards sustained transport investment because data from the World Bank shows that private capital in transport in countries of low and middle income grew 400% between 1990 and 2012. This suggests that the return of private investment in transport in the developing world is seen more positively than in the past. Positive perceptions towards transport investment means that Brazil will have more opportunities to build BRT stations, metro rails, and cycle paths that promote healthy cities and transit-oriented development. We blog about sustainable transport because we know it is a pivotal part in aiding human health. According to the World Health Organization( WHO ), at least one and a half million people die every year worldwide due to respiratory disease attributed to fossil fuels (petrol and diesel). In São Paulo, for example, 90% of air pollution comes from cars. What’s more, traffic is the eighth leading cause of death worldwide. The development of public policies and projects for sustainable transport can reduce this ratio while improving quality of life. The time to discuss mobility and sustainable development has never been more propitious. With the approach of the World Cup, Brazil is on the world stage. Urban mobility is a major challenge for the event, but even more importantly, it is a microcosm of mobility issues that residents of Brazil face every day. Of the 41 works established for the World Cup, five are completed. The amount invested in the mobility sector has already shrunk, and a failure in the eyes of the world could inhibit even more future transport investment from the private sector. Brazil has already made great strides in recognizing the necessity of sustainable transport, from developing São Paulo’s priority bus lanes to entering transport as a right in the Federal Constitution. TheCityFix Brazil has been with Brazil each step of the way, working to spread this dialogue to Brazil’s cities and the world at large. The more people we reach, the more information is carried forward towards bringing a critical eye on the context in which we live and making significant, impactful change on the future of Brazil’s cities and those who live within them. We rely on you and with your vote! Voting is easy: click here and use the email accounts and / or Facebook. This post was originally posted in Portuguese on TheCityFixBrasil.com. Vote for TheCityFix Brasil for the Mobilidade Minuto Award! TheCityFix Brasil selected as Brazil’s best sustainability blog of 2013-2014!